Preventive Dentist in Downtown Washington, D.C.
Every smile needs a strong foundation of health and preventive attention that will carry it through the years – after all, isn’t it easier to stop a dental problem when it hasn’t even gotten the chance to start yet? At Davidson Dental Associates, our dentists can provide in-depth checkups, professional cleanings, and other likeminded services that are designed to preserve the strength and stability of oral structures for the long-term. If it’s been more than six months since your last visit to the dentist’s office here in Washington, D.C., please contact us today. 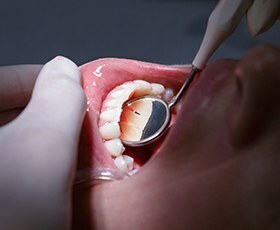 Even patients who are diligent brushers and flossers may fall victim to subtle, damaging dental concerns that hide out of sight. That’s why scheduling a regular checkup and cleaning with your trusted dental office twice a year is so important. Our team will leave no stone (or tooth) unturned as we thoroughly review every component of your oral health for troubling symptoms and remove decay-causing plaque and tartar from the mouth. Do your teeth seem flatter and more worn-down over time? Has waking up with jaw pain become a regular part of your routine? These troubling symptoms usually indicate bruxism, which is the fancy name for habitual teeth grinding. As a solution, our team can provide a custom-made nightguard that provides plenty of comfort and much-needed protection. 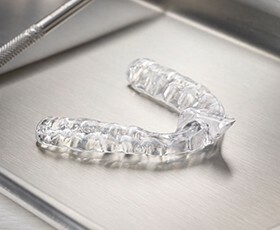 Since most patients experience bruxism while sleeping, this appliance can protect your vulnerable smile until morning. On average, a person dies from oral cancer every hour here in North America. What’s worse is that many of these cases could have been recovered from if they were correctly diagnosed sooner. Your dentist is the first line of defense against this dangerous type of cancer, which is why screenings are a crucial part of your checkups. 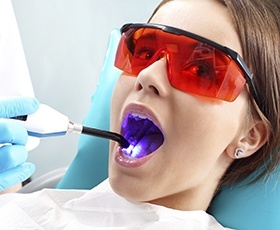 One of our dentists will use VELscope technology, which shines a harmless frequency of blue light into the mouth and clearly reveals areas that may be abnormal. Further testing can be arranged if any troubling findings arise from your screening – we want to ensure your safety! Regular exposure to fluoride offers lasting positive improvements regarding a patient’s oral health – in fact, studies show that this mineral can strengthen tooth enamel and aid in the remineralization process, which means that you’re likely to experience fewer cavities over time. If our team determines that you could use an extra boost, professional fluoride treatments are available during routine appointments. The process only takes a few minutes to complete! 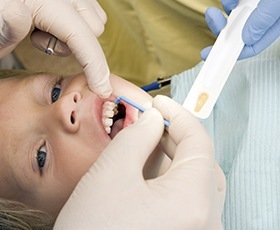 Dental emergencies tend to happen suddenly and without any warning. In the busy Washington D.C. area, we know that many people can’t afford this type of calamity throwing a wrench into their busy schedule. That’s why our office will make every effort to see you right away! With a team of general dentists and specialists on staff, we can arrange relieving care before you know it. Strong, healthy gum tissue is an important part of your overall oral health, but it can be threatened by infection. Thankfully, our team features Dr. Winson, who is a highly-trained periodontist with decades of experience. He, alongside our talented hygienists, can revitalize gum health, remove harmful bacteria, and restore your smile’s full vitality.